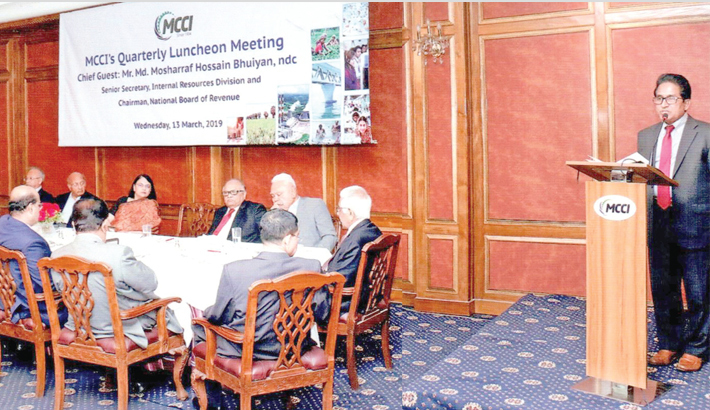 National Board of Revenue (NBR) Chairman Md Mosharraf Hossain Bhuiyan speaks at the Metropolitan Chamber of Commerce and Industry (MCCI) quarterly luncheon meeting at MCCI office in the capital on Wednesday. bKash Chief Commercial Officer Mizanur Rashid and Pizza Inn General Manager Mohammad Ashfaque Hossain exchange documents after signing an agreement on payment service at Pizza Inn office in the capital recently. Johannes Teyssen (L), chairman of German energy giant EON, and CFO Marc Spieker address their company's annual press conference on Wednesday in Essen, western Germany. EON said it would pay out a higher dividend for 2018 as it reported growing profits, performing better than expected in a year of deals with major competitor RWE. An Indonesian fisherman unloads yellowfin tuna after returning from sea at Banda Aceh, Aceh province on Wednesday. Bank Indonesia will conduct regular open market operations of repo and foreign exchange swap auctions three times per week to boost rupiah liquidity in the banking system, the central bank said in a statement. Indian labourers works in a construction site at the New Chumta Tea estate on the outskirts of Siliguri on Tuesday. Positive developments in economic conditions, improvement in investor confidence and investments in transport infrastructure, energy and housing projects have helped the Indian construction industry regain growth momentum in 2018, with output value increasing from US$464.9bn in 2017 to US$505.7bn, says GlobalData, a leading data and analytics company. State Minister for Power, Energy and Mineral Resources Nasrul Hamid is seen with the newly-elected members of the 9th executive committee of GTCL Officers’ Welfare Association at Celebrity Hall of Bangabandhu International Conference Centre (BICC) at Agargaon in the capital on Saturday. Islami Bank Bangladesh executive committee Chairman Prof Dr Md Salim Uddin speaks at a seminar on ‘Sustainable Development Goal- SDG: A Universal Call for Transforming the World’ at Hotel Agrabad in Chattogram recently. Chattogram Regional Committee of the Institute of Chartered Accountants of Bangladesh (ICAB) organised the seminar. Dhaka Bank Managing Director and CEO Syed Mahbubur Rahman poses for a photo with female officers of the bank on the occasion of the International Women’s Day at its training institute in the capital recently.